SYRACUSE — Roy O. Caywood Jr. of Syracuse will celebrate his 95th birthday April 10. Roy was born April 10, 1924, to Roy Sr. and Helen Caywood. He married Inez (Gordon) Jan. 20, 1945. She passed from this life in September 2015. Together they had three daughters: Jackie (Bill) Kitson, Syracuse; Chris (David) Waldrop, Syracuse; and the late Sandra (Larry) Weisser, Milford. Additionally, Roy has six grandchildren and 15 great-grandchildren. A North Webster-area resident for most of his life, Roy also spent part of his childhood in the Hammond area and later farmed in Mora, Minn. He is a U.S. Army combat veteran of World War II. 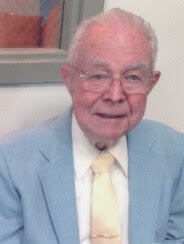 Roy worked at Weatherhead Corp. in Syracuse and later retired from Da-Lite Screen in Warsaw. He was a farmer for many years, as well. Roy would love to receive cards from friends and neighbors for his birthday. Cards can be mailed to Roy Caywood, 8631 N. 500E, Syracuse, IN 46567.